Paleo Blueberry Lemon Cheesecake Recipe. 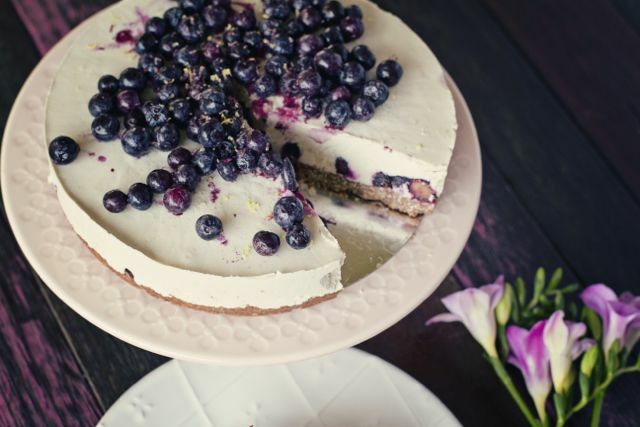 This Paleo Blueberry Lemon Cheesecake tastes as good as it looks! It’s also low fructose which means it won’t spike your blood sugars. We use rice malt syrup in this recipe but if you’d like to use a different sweetener, check out our post on paleo natural sweeteners and swap it for your favourite! Plus, what’s even better is that Australian Blueberries are now in season (July-April here in Australia!) so get your blueberry on! p.s how pretty is the photo of this cake? Thank you to Bel Combridge Photography for taking this photo! Line the base of a 20 cm spring form cake tin and grease the edges with coconut oil. In a food processor, whiz the walnuts and coconut until a fine meal forms. Transfer the meal in to a large mixing bowl. Add the coconut oil and rice malt syrup to the bowl and mix together well. Once it’s all combined, press the base in to the cake tin evenly. Now for the filling. Drain and rinse the cashews and place them in to the food processor along with the coconut milk, coconut oil, rice malt syrup, lemon juice, rind and vanilla powder. Pour the filling on top of the base. Sprinkle the blueberries on top of the filling and press them in to the filling so they are covered. Shake the tin to even out the top and place the cake in to the freezer for around 2 hours or until set. Rub the outside of the cake tin with a hot cloth and release the spring form slowly. To serve, garnish with extra blueberries and a little lemon rind! Cut in to slices with a hot knife and store any left overs in an airtight container in the freezer. Merrymaker tip: Swap the rice malt syrup for honey or maple syrup if you like!